Slide into winter with a memory that will give you the look and feel of being out in the cold while still enjoying the warmth indoors! We take your picture during a live photo shoot in our All Digital Photo Studio set up on-site at your event. 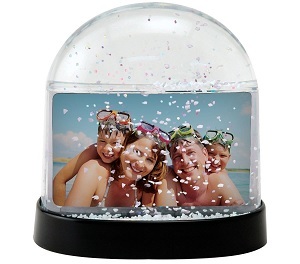 Within minutes your photo will be turned into a 2″ x 3″ image to place inside a real snow globe. Create a custom insert for the back side so your guests remember where there memory was from, this adds a little extra pizzazz to your snow globe.